Everything in this cosmos lived their life in the parabolic shape. It means starting from the bottom, gradually climbing up to the most top point only to go down and perish. This happened to the Norse world, too, from the Cosmos Creation to the event that finally put an end to the golden period of Norse myth was Norse Ragnarok. Ragnarok was the word to indicate the twilight of the Norse pantheon and the Norse world as a whole. The word “Ragnarok” consisted of two compounds. The first “Ragnar” meant gods, the high power, the ruling power. The problem was the second compound “rok” which meant “fate”. Thereby, we can translate the word into “The final destiny of the gods”. And yes, it was the final destiny, the final twilight of the Norse pantheon. Actually, Norse Ragnarok was prophesied. Series of events would take place to signal the days of Ragnarok looming large. The very first sign of Ragnarok was the death of Baldur. Baldur dreamt about his own death before it came into being. 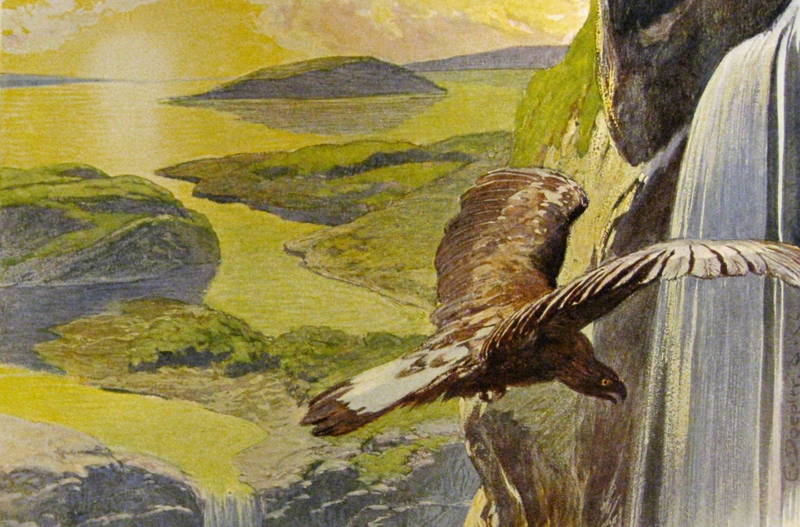 This event not only broke the heart of many in Norse myth but it also worried all creatures in the cosmos as they knew they were to face their final fate Ragnarok. Accordingly, the second sign was a long winter coming in a row for three years which meant no summer came in between. This longest winter was the Fimbulwinter. There were wars everywhere in Midgard, blood was shed, and brothers would kill each other. The third sign was Hati and Skoll, who were the sons of Fenrir, swallowing the Sun and the Moon. The Nine Worlds fell into darkness and even the stars disappeared. The giant living in Jotunheim were quickly informed about the beginning of Ragnarok by a red rooster known as “Fjalar”. Deep under the root of Yggdrasil was Helheim, there was also a rooster that signalled the dead army to prepare to fight in Ragnarok looming large. The gods and goddesses up in Asgard were informed by the sound from the horn of god Heimdall, Asgard watchman. Human warriors that lived in Valhalla and Folkvangr up in Asgard would also prepare their weapons and armours to get ready for the battles. They had been chosen and trained only for the moment of that day. Those warriors fought alongside Odin against the army of the giant. Loki and his children were the leaders of the villain army. After breaking himself free from the magical chain by Aesir gods, Loki assembled his army to make the gods pay for what they had done. Fenrir, the notorious wolf son of Loki also set himself free from the binding of gods to join the battle with his father. The other son of Loki, Jormungand the Midgard Serpent who was cast into the deep ocean by Odin as a precaution against Ragnarok, released himself from the ocean to poison the sky with his venomous breath. Hel, the daughter of Loki, sent her army from Helheim to join the giant army. Together they entered Asgard through the Rainbow Bridge Bifrost. The war took place at the plains Vigrid. Everyone met their sworn enemies in the battle of Ragnarok. Odin faced the giant wolf Fenrir. More’s a pity, Fenrir swallowed Odin right in their battle of Ragnarok. A son of Odin, Vidar, took revenge on Fenrir though. Thor and Jormungand encountered each other once again in Ragnarok. Thor managed to kill Jormungand but the venom that Jormungand left killed Thor when he was taking nine steps away from the serpent. Heimdal and Loki killed each other. God Freyr was killed by the giant Surtr who set the whole world on fire with his burning blades. What left after Norse Ragnarok? The war ended finally. But the loss was too severe. The Norse pantheon nearly collapsed. There were only a few of them making through those darkest days. The new sun was born and everything was lit again. God Baldur came back to life from Helheim after Ragnarok had come to pass. Some other gods and creatures assembled and they built a new world with each other. Though there was no appearance of Odin, Thor, or Fenrir, tales about them still heard. The survivors carried the stories and lessons from the old period to enter the new world. There were two humans that survived. They entered the new world and repopulated it. Yggdrasil Tree was still there after trembling. This Great Tree of Life was the shelter protecting the two humans from the danger of Ragnarok. In the past, what the giant did was totally wrong. In the modern interpretation, however, the giant, namely Loki, Fenrir, Jormungand, and Hel, were making the gods pay the price for what they had done to the family of Loki. Gods broke their oath and tricked Fenrir into the binding. 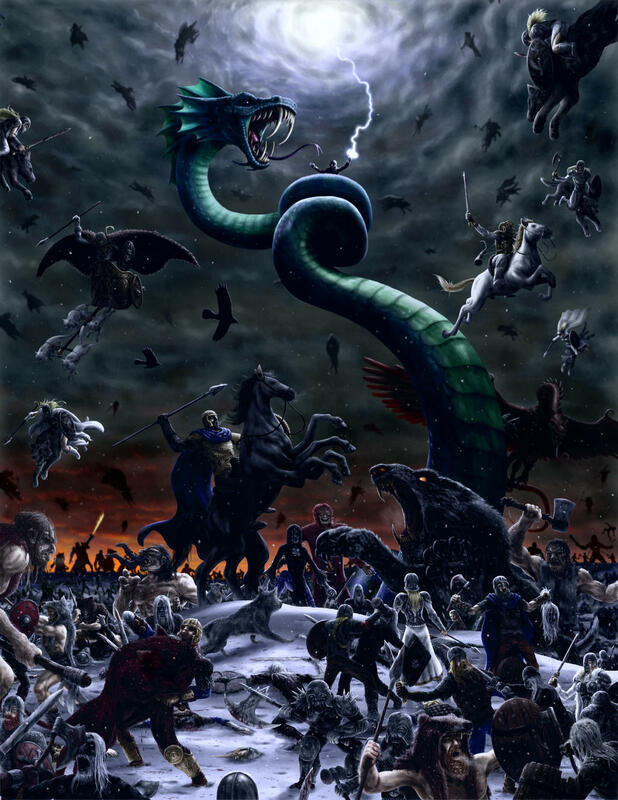 Odin cast Jormungand into the deep ocean even though the serpent was too little at that time. Gods banished Hel into the land of the dead where she gradually built up her army. Many interpreted the deeds of Loki was reasonable and what gods were just suffering the things that Loki and his children had been suffering.